A week or two ago, the illustrious Jim Manley ran a Raspberry Jam – a meeting of people interested in the Pi. Unfortunately someone walked off with his Raspberry Pi. A bunch of us were chewing over ideas, on the Raspberry Pi forums, for how to add security features to make it possible to locate a stolen Pi. 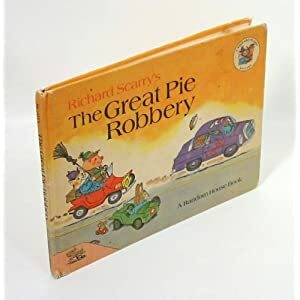 Except the pies in the book were cherry, not raspberry. Someone else (rurwin) suggested getting your Pi to ‘call home’ by email using a Googlemail or gmail account. So here’s the code. Feel free to use it, improve it customise it and change it. I take no responsibility for how you use it or what happens. If you are likely to expose your Pi to other people, it would be a good idea to set up a dedicated googlemail account just for this because if your Pi is stolen, the perp will potentially have access to the googlemail password. ifconfig gives output of mac address, network connections with internal IP addresses and general information about the network status of ethernet, wifi and local loopback connections. cat /proc/cpuinfo gives you serial number and other cpu related information. And in the email header you have the IP address of the internet connection the Pi is connected to. The one inside the ([ ]). Obviously I have changed mine for security reasons. Edit pifind.py to insert your own google account username and password and your from and to addresses. I have found this quite useful for finding the IP address on my system when I am running headless (no screen). It sends me the IP address every time I boot up the Pi. Are you aware of the open-source Prey Project, it’s open source, has some nice features, runs “stealth” and you don’t need a dedicated Gmail account. Hadn’t heard of that one. Looks good for phones and laptops, but as you said – so easy to remove the SD card, it’s less useful for the Pi. Thanks, it’s just I’am looking for. You’re welcome. Hope it helps. If you have two level login on Google, you will need to use an application specific password, but best idea would be a dedicated gmail account just for this. That’s a weird one. How did you get hold of the file? Has a space slipped into line 2 accidentally? I also added an Apache License to make it truly open source. If that’s all not okay for you tell me and I’ll take it down again. Thanks for the nice work you did. Ho installato e provato pifind.py, e funziona egregiamente. Ma visto che basta cambiare l Sd per perdere definitivamente il PI ho deciso di disattivarlo. Esiste un modo per DISINSTALLARE pifind.py e ripulire la distro? I installed and tried pifind.py, and works well. But since just change the Sd to permanently lose the IP I decided to turn it off. Is there a way to UNINSTALL pifind.py and clean up the distro? and see if that helps. That’s how I usually run Python scripts from cron. But there are other issues with cron, such as the need to specify absolute file paths for everything, which can cause issues that are very hard to track down. I really like this code, it’s been really useful, thanks. I’ve been trying to figure out how to add the external ip address to it, the output from curl ifconfig.me. I don’t suppose there is an easy way to do this?